This round was generously sponsored by the Bricklink Store, MT-Bricks. While the black fan made for quite a challenging seed part, Aaron Newman, Julian Andries, Legofin, and Guy Smiley all still came up with some lovely entries. There were 20 builds submitted in all. All of which can be seen in the ABS Builder Challenge flickr group. In the end, Aaron Newman was declared the winner by our panel of 5 judges. Keep reading to check out the detailed score breakdown, and see some interview questions with the builders themselves. Aaron - I loved how the ABS challenge, well, challenged me. It forced me to branch out into building styles, genres, and subjects I wouldn't normally think to tackle. That, combined with the contest's short time limit and the excellent builds by my competition, propelled me into a very prolific, enjoyable, and insightful few weeks as a builder. Julien - For me the best part of the contest would be that it got me out of my comfort zone, which was the main reason I wanted to participate in the first place. There are so many different lego elements and I found myself not ever using some (a lot) of them. I also tend to build in a couple of themes and stick to those. I thought it'd be a fun challenge to switch that up for once. Just being somewhat forced in a direction you did not pick yourself can be interesting and it was a lot of fun trying to be creative with a given part. Legofin - Just taking part in the competition was a lot of fun, the anticipation before the part was revealed and the challenge of coming up with ideas were both enjoyable aspects of the contest too. Pinpointing a favorite part is different as really the competition as a whole was a lot of fun. Aaron - Initially, I thought to myself: "geez, this part has just one connection point!" I was, of course, proven wrong by builds like Julien's Pegasus and Legofin's art gallery but even so, the part's lone bar felt like a challengingand funlimitation. I also discovered that the part lent itself best to smaller builds, which is reflected in my entries. It's such a small curve, and has such delicate detailing that would have felt lost, I think, on a bigger model. Julien - First thought: "why did I agree to this"
Haha, jokes aside. At first I really had no clue what to build with the part and thought it was rather useless. Except for a microscale staircase I didn't really see anything in the part (I ended up not even using it as a staircase hehe). But after just thinking about it for a couple of minutes it really grew on me. So yeah, my view on "the part" but also on that sort of parts in general is a bit different. I'm actually strolling through bricklink as we speak trying to order some random parts I would otherwise never use. So there might be more random out of the box builds from me. Legofin - I'll avoid any vulgarities and just say my reaction was along the lines of "oh geez"! It was hard to see the part as anything else as the fan piece is specifically molded to be a fan, but I guess it just added an extra challenge. I still feel like it's an awkward part to use, but I think I'll try and incorporate it into future builds even now the competition is over! Aaron - "The Center for the Performing Arts" is probably my favorite thing I made for this challenge, largely because I think it constitutes my best and most creative seed part use. This part use dictated the rest of the MOC's existence, design, scale, and colors it felt great to be building around a perfect idea like that, rather than trying to shoehorn the seed part into something where it didn't fit as well. 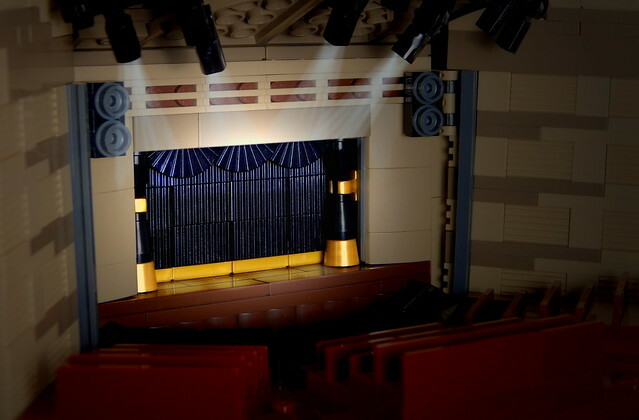 I took about two or three hours, total, to make the theater. Editing my shot of the MOC took another hour or so, mostly because I played around with so many different lighting effects and extras before finding what looked best. I'm extremely satisfied with the end result. Julien - Erm. Well. I actually quite like my Commander Brickington bust which was the first model I made. It was definitely the most out of the box-kind of model for me as I generally don't do large figures, I'm more of a building man. So building something completely different and incorporating the part in 3 different uses in such a small build was fun. It is also the only build I have still got assembled, it's sitting on my desk as a desk buddy and I don't see it leaving soon. He's my little building friend now haha. I think it took me about 4 hours to build or so. Which might seem quite a lot for such a small build. It is actually. But like I said before. I don't usually do these kinds of models so change is always difficult, and it wasn't easy incorporating the seed part in an original way. Well ok it was, I made the model around the idea of having eyebrows. But to put the idea into actual bricks was a little tricky. 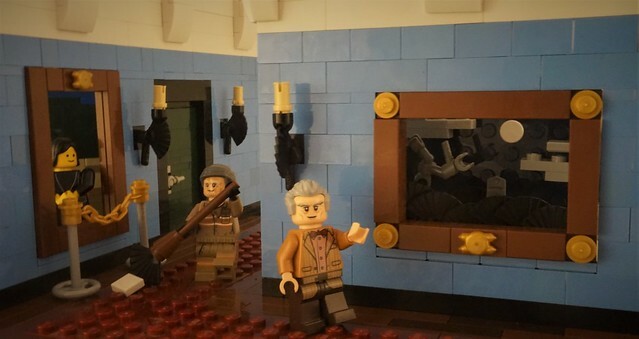 Legofin - My favorite build I built would have to be the art gallery, as although sometimes tricky to build immersive scenes are always enjoyable. It started with just the fan pieces arranged next to each other to ressemble hills, then came trying to incorporate these micro hills into a build. Forced perspective was an option but in the end I decided it would work as a painting in an art gallery. Once the idea was formulated the build itself didn't take long, although as the scene was going to be relatively big I didn't want to piece to just be a small "detail" so tried to come up with other uses for it in this build. Eventually I found 3 different uses for the part in the one build, as the hills, candle holders, and as the cleaners' broom. 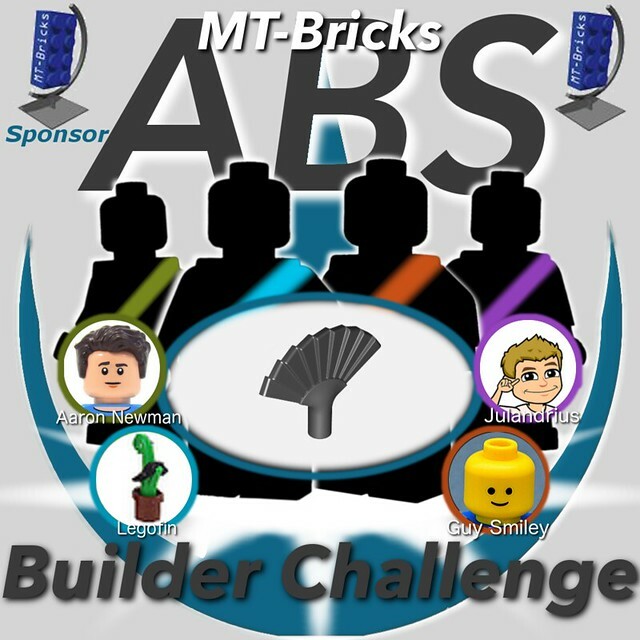 We want to thank the competitors for building for the ABS Builder Challenge and thank this round's sponsor, MT-Bricks. As ABS continues to build momentum, we hope to see you apply for a future round in our Flickr group!